When a product claims its ingredients are not only effective but also safe, you want to believe them. We found with Porcelain Skin Whitening Serum that their claims to be effective were true and while the safety is a bit controversial, overall this product just might deliver on its promises. Let’s see the specifics of those promises. This product claims to use multiple effective ingredients, with 97% of the ingredients being high quality and natural. We’ll take a look at the ingredients in a bit, but let’s talk about what Porcelain Skin Whitening Serum says those ingredients accomplish. Based on consumer trials, 80% of users saw results in six weeks. Porcelain Skin Whitening Serum claims to reduce age spots, dark spots, freckles, sun spots, scars, and other areas of uneven skin tone. It says it is suitable for any skin tone, as well. Porcelain Skin Whitening Serum mainly emphasizes the safety of its main effective ingredient, hydroquinone. It can sound a bit concerning based on how hard the product is trying to convince users that the ingredient is safe, but for the most part you may not need to be overly concerned. Hydroquinone can be a controversial ingredient. The FDA says the ingredient is safe, but that doesn’t mean there aren’t potential effects, especially considering there are still studies being conducted. Hydroquinone, while it effectively disrupts the production of melanin (the pigment that creates a dark skin tone), can also cause irritation. Your skin can become dry, red, or cracked because of hydroquinone. It should also be noted that hydroquinone is potentially a carcinogen (though there is no conclusive research on its potential to cause cancer yet). Pregnant and nursing individuals should not use products with hydroquinone, which Porcelain Skin Whitening Serum does not mention. Still, the product contains other effective ingredients that are natural and come with fewer side effects. In addition to hydroquinone, Porcelain Skin Whitening Serum contains kojic acid, licorice root extract, and mulberry extract. Those ingredients help reduce melanin production and provide anti-aging benefits. These are all effective and natural skin lightening ingredients, which we like. The serum also contains glycolic acid, which works to exfoliate the skin. This ingredient increases skin cell turnover and helps all of the ingredients that work to lighten your skin penetrate deeper and work more effectively. We also like that Porcelain Skin Whitening Serum lacks comedogenic ingredients, or ingredients that will clog your pores. If you’re prone to acne breakouts, you may find this product plays nice with your skin. Like a lot of products, Porcelain Skin Whitening Serum is really hit or miss. You may also experience irritation or skin peeling (which we suspect is a result of hydroquinone). 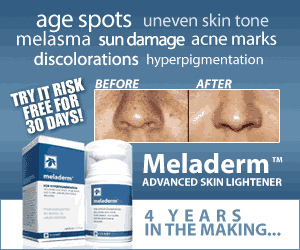 Porcelain Skin Whitening Serum says in its directions that light peeling and redness are normal. Those side effects may be alarming to some users, but with gradual and continued use, those effects should subside if your skin isn’t very sensitive. If you do have sensitive skin but still want to use the product, start out applying Porcelain Skin Whitening Serum every other day and work your way up to daily use. Remember to spot test the product on a discreet area and use moisturizer and a sunblock once using the product. We do like that Porcelain Skin Whitening Serum offers a 45-day money back guarantee. If you’re looking to try this skin lightening serum, you can find a 2 oz bottle on Amazon for $29.98 here.